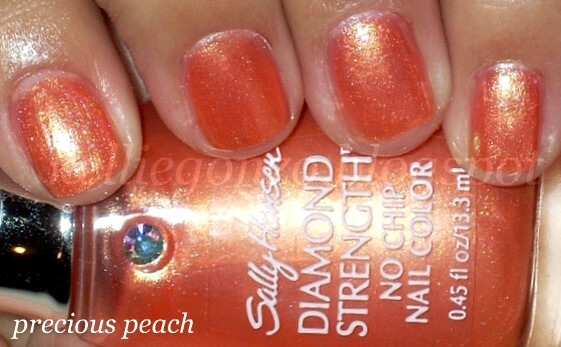 here are a few swatches of some sally hansen diamond strength polishes i picked up at a rite aid a while ago. i don't love these so much. i don't care for the extra looooong necks on the bottles at all. because the brush handle then has to be really long and that makes me clumsy because i have small squat hands and short fingers....and i'm naturally a klutz. the formula seems like it doesn't dry very fast either which tends to cause bubbles more often than not. 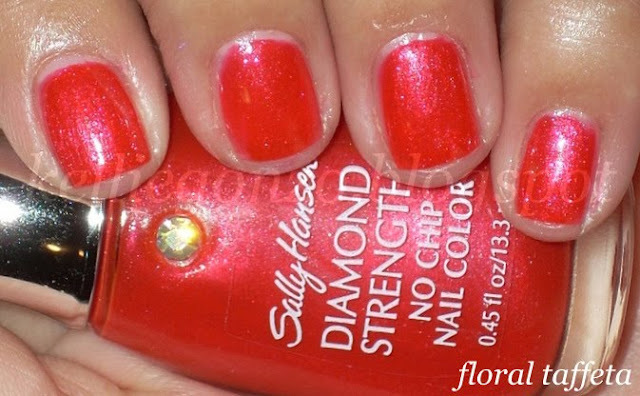 floral taffeta is my favorite out of these three, a pretty reddish strawberry color with a nice subtle diamond shimmer. i managed to get this one to dry sans bubbles thank goodness. this is three coats. champagne toast is totally the wrong name for this light pink shimmer. it is a nice safe shade with a hint of dazzle, but it is not the color of champagne or toast. le sigh...so weird. this went on pretty streaky no matter how long i waited between coats or how many coats i applied. i stopped at three (coats) on the second try. i'm glad i got these bottles on clearance or else i would be upset. in stores they can run you around $7 a bottle! no thanks, i would pay that much for a good quality opi but for drugstore polish? nah.